There may be situations where you may want to distribute a customized version of Firefox to others. Maybe you are admin of a network, webmaster who wants to make available a special Firefox version or want to create a special version of Firefox for friends and family that comes pre-equipped with some of the coolest extensions and customizations. CCK2 Wizard -- CCK stands for Client Customization Kit -- is a free add-on for the browser that helps you create this customized version. The result is either an extension that users can install to make these modifications or an autoconfig file that needs to be put into the main Firefox directory so that it is picked up automatically. Note: Two versions of CCK Wizard exist currently. CCK Wizard 1.x has been updated one last time today but won't receive any more updates. CCK2 Wizard 2.x is the new version that you should install. A click on the extension icon after installation starts the process. You have options to create customizations from scratch or load a previous customization instead. The extension displays all customization options in a single window. You click through each option displayed in the sidebar and make modifications as you see fit. Add add-ons that get installed. Use CSS to hide or modify user interface elements. Modify or lock preferences such as disabling sync of Firefox updates. Set the home page, welcome page and upgrade page, or hide them. Set website permissions in advance. The list is far from complete and it will take some time to go through all menus CCK2 Wizard offers the first time. Once you have made all general modifications you need to decide whether to create an extension that contains all the customizations or an autoconfig file instead. If you decide to create an extension you need to add a unique ID to it before you can do so. All other options such as the homepage and update url, icon, filename or description are optional. If you have created an extension, you need to distribute it along with all the files and folders it creates. The extension gets installed just like any other add-on in Firefox and you should not run into any issues installing it. The autoconfig file is provided as a zip which you need to extract to the Firefox main program folder (not profile folder) on the system you want it deployed. 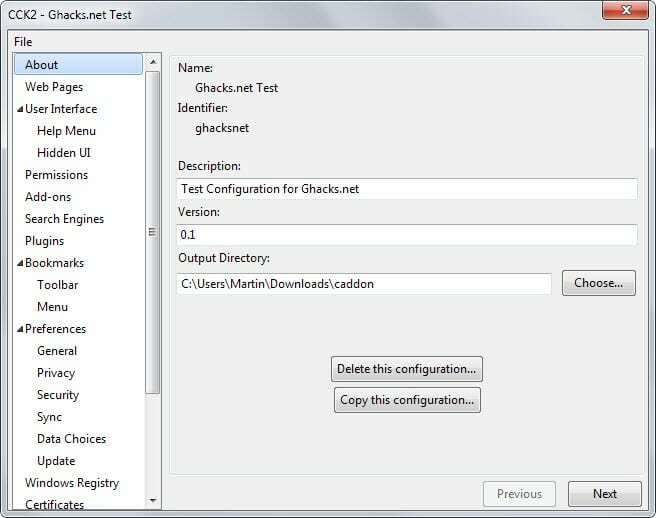 CCK2 Wizard is an excellent extension for Firefox that makes it dead easy to distribute and deploy customized versions of Firefox. The customization options it provides are powerful and leaves little to be desired in this regard. Holy, mother of God, does this have potential that I’ll have to explore! I’ve been wanting an easier way to copy my profile to Linux without so much tweaking for addons, scripts, etc! This may well just streamline it! Thanks, Martin! Yeah, if I wasn’t packing everything into boxes to move next weekend, I’d be REALLY playing with this one now! This goes in at the top of my “projects-to-play-wth” bookmarks! LOL! I haven’t tried it for several years. Sounds like a fun thing to do on a crappy late Autumn day. all my browser addons, themes & configuration? (…and eventually fully-restore everything, if needed?). I don’t think it can be used efficiently for that as it won’t include specific data such as your browsing history or cookies. I have the same question as interstellar. Can I use this as a backup for my FF with my add-ons, themes and configuration? FireFox 35.0 and Wins 7-64. Interesting. A question, perhaps indicative of the slowness of my old brain: what would be the difference between using CCK Wizard or doing this – set up Firefox as desired, then run %appdata% to access the Mozilla folder – then copy that folder into the the Firefox of the 2nd location after having deleted the Mozilla folder from it? This is how I have been keeping all my customizations and bookmarks when it is necessary to restore to a really old backup because a problem not curable by any other means went undetected for a long time. A recent circumstance where I used this process was discovering last week that ever since I updated EMET from 4.1, Internet Explorer 11 would not work. This was true on both my windows 8.1 desktop and windows 7 laptop. I had to restore all the way back to an August image to fix both pcs. The reason it took so long to notice the problem is that I almost never use IE. Anyway, when you must go very far back to an image, it is important to be able to keep your up to date documents, videos, pictures, etc. Windows wont let you copy and past those windows folders onto a separate drive so you you can then copy and paste them to the restored image. What you must do is copy all the items from those native windows locations into a similarly named folder within the native windows folder. Those new folders which are not native folders can then be copied and pasted to the restored image.Since this is so, all of my documents are in a Documents folder which is located in the windows My Documents, in order to streamline the process when it is needed. Of course, going back so far costs a lot of time in all of the updates that will then have to be done to windows and other software, and care must be taken that any software installed in the interim period is not totally forgotten about! One thing that helps me with this is to transfer every software installation file from the downloads folder to a folder on my external drive, so that location serves as a reminder of what software has been installed in case something gets forgotten in the process, as well as a repository from which to reinstall without having to go download it again. I strayed a bit from the original topic, with the intent of possibly being of benefit to some of the less techie readers here – of which I am one. Hopefully you will not be distracted from the query that began this comment. to Windows’ %appdata% folder for Firefox? I have had several tries with different Linux distros. Never did any of them ever work completely and help was very hard to find and usually assumed I knew more than I did know, so I gave up, though I still use Linus based rescue usbs. This by way of freely admitting the notion I am about to present may not fly on Linux, but still it might and so I mention it. If you can use the Search Everywhere software (or Glary, which includes an equivalent search feature in its tool set), just search for the Mozilla folder (or there might be a good searching application over there – I just don’t know). I get 4 results on that search in Windows. If you can find them with this method, the one in appdata/roaming is the one you want. If the nomenclature is different over there and you don’t see one located as just described, then try the procedure with each in turn until you find which one works. Don’t forget to have a good backup image made (one of the things I never could get to work for me in Linux!) ahead of time. No warranty, expressed or implied, applies to this woeful help effort!! Perhaps my thinking here combined with your Linux experience will lead you to think of something better. Good luck. I once wrote myself a small “guide” on various about:config options, and a year later a large portion of the guide was redundant because so many variables had changed. This addon is no longer available. Bummer. It has been removed from Mozilla’s site, but it is still available at the author’s own. I have changed the links to reflect that.